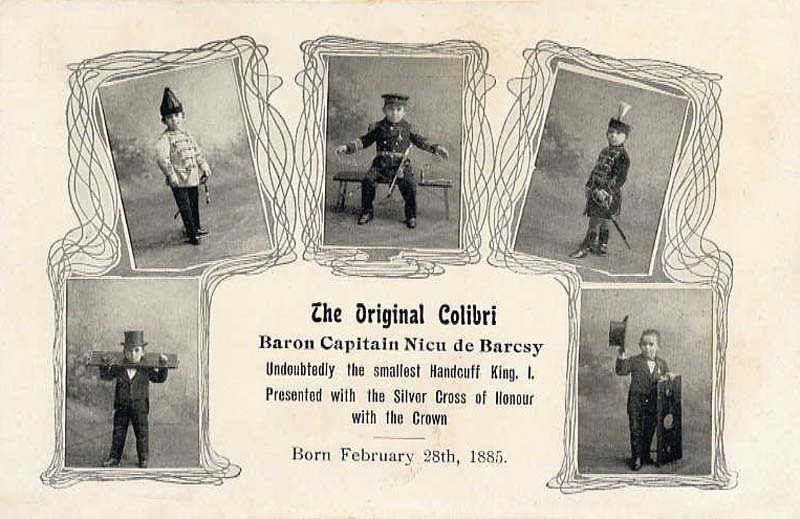 Unlike so many circus performers who claimed aristocratic titles for pure showmanship, Nicu de Barcsy really was a member of the Hungarian aristocracy. In fact, his royal lineage is perhaps the least unusual aspect of his background. In Budapest during the 1880's, the lovely and buxom Sidonia was courted by a young cavalry officer, Baron Anton de Barcsy, and eventually the two were married. Soon afterwards Sidonia became pregnant and the couple was overjoyed by the prospect of an heir. 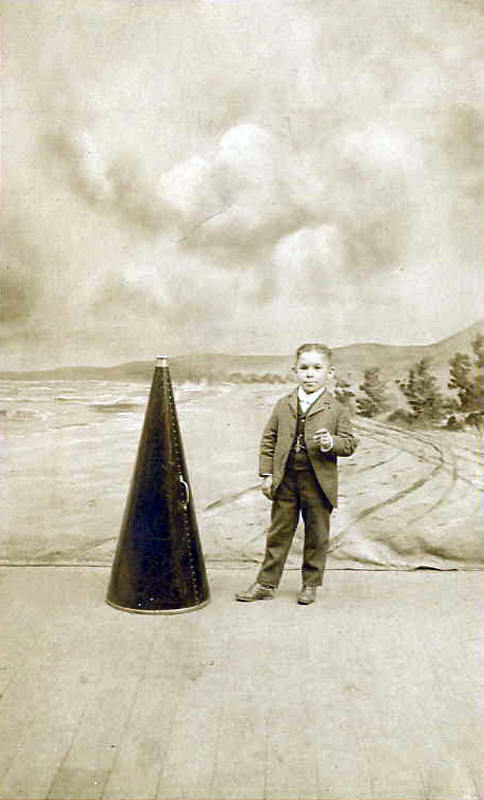 Little Nicu was born on 28 February 1885 — and little he was. Although perfectly proportioned and seemingly healthy, Nicu weighed less than two pounds at birth. Distressed by Nicu's size, Sidonia soon had problems of her own. Twelve days after Nicu's birth, Sidonia noticed a downy fuzz growing on her chin and cheeks. The rapidity with which this fuzz turned into a full chestnut-colored beard was in direct contrast to Nicu's stunted development. Baron de Barcsy was forced to accept that not only was his son a dwarf, but he was married to a bearded woman. To further complicate matters, all was not well in Hungary on the economic and political fronts. The country was in a state of turmoil, and the baron fell victim to the chaos. Within a short space of time Baron de Barcsy had lost a great deal of money in stock speculation, and as a member of the military elite he soon found himself on the wrong side of a national political struggle. 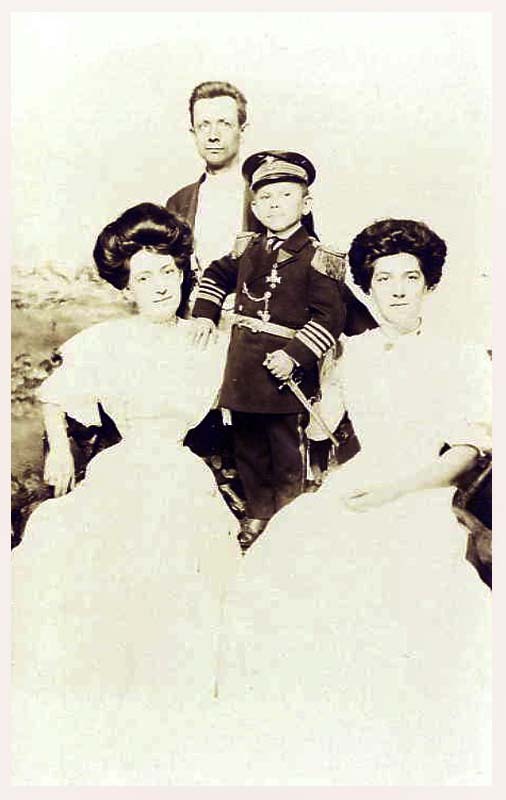 While Nicu was still quite young, the de Barcsy's were forced to flee Hungary for the safer climes of western Europe. Now penniless refugees, the family needed to find a way to support themselves. As aristocrats they had little experience with gainful employment, but the baron now realized that the unique series of unfortunate familial circumstances made them ideal candidates for work in the circus. A source of embarrassment quickly became a handsome meal ticket. 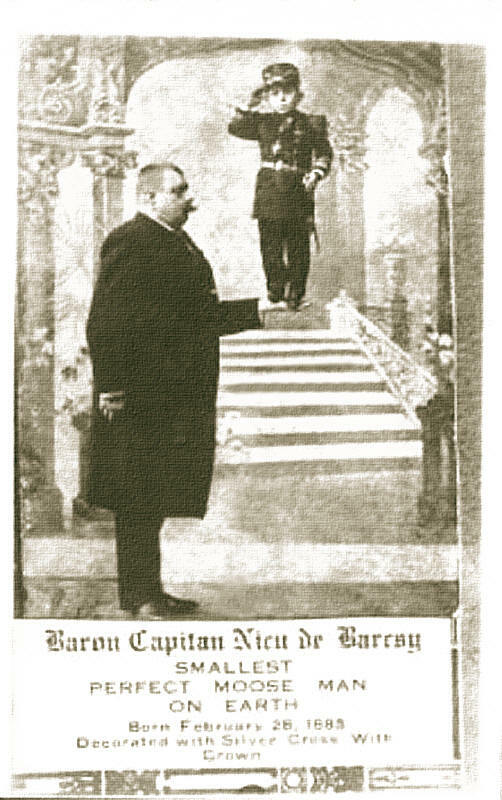 Having quickly turned misfortune into opportunity, the de Barcsy family was a genuine sensation with circus audiences across Europe. It could hardly have been otherwise when one family unit contained all that a circus promoter could hope for: a bearded lady of grace and charm, a 28-inch-tall dwarf son billed as "The Smallest Perfect Man on Earth", and a powerfully built patriarch who often lent his 6-foot-3-inch 400lb frame to the task of strong man. For fifteen years the family performed all over Europe, but in 1903 set sail for the greener shores of America. 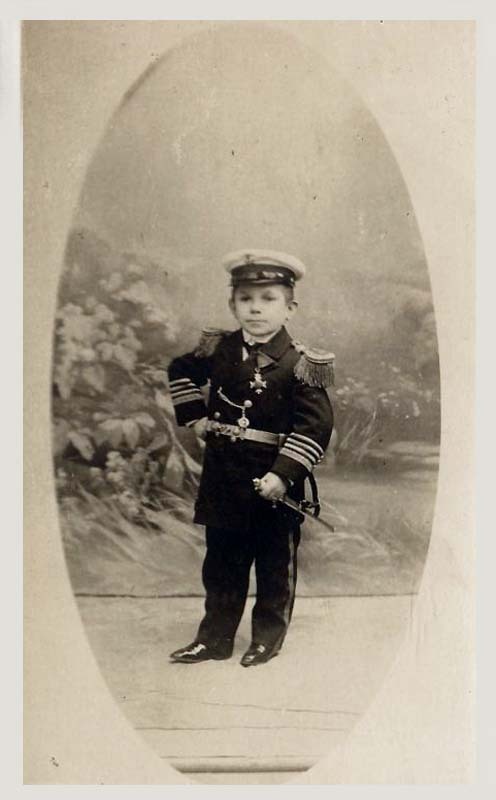 By 1903, Nicu was 18-years old and proudly wearing the Hungarian silver cross, which he claimed as his birthright. 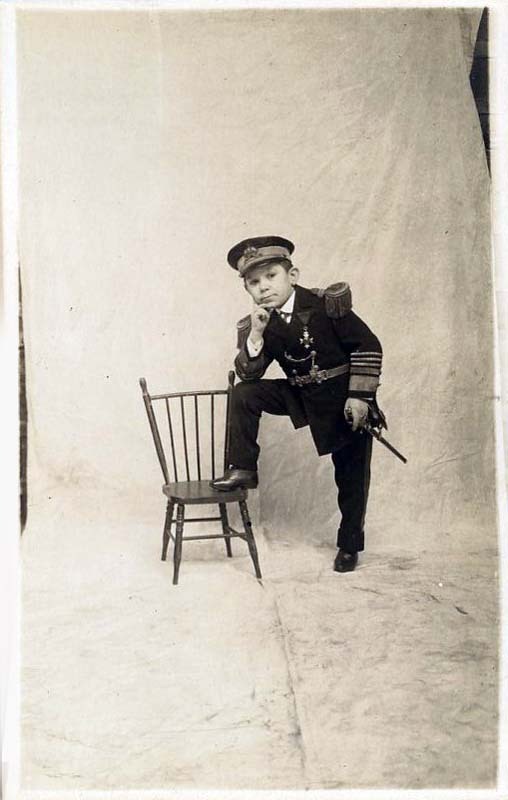 Nicu also insisted that he be addressed as "Capitain". For the next decade, the de Barcsy's worked with most of the best known shows, including Ringling Brothers Barnum & Bailey, Hagenbeck & Wallace, and the Campbell Brothers Circus. Perhaps fascinated by their royal heritage, American audiences received the de Barcsy's even more warmly than they had been accustomed to in Europe. During the winter months, the de Barcsy's lived quietly in a fashionable New York City apartment. 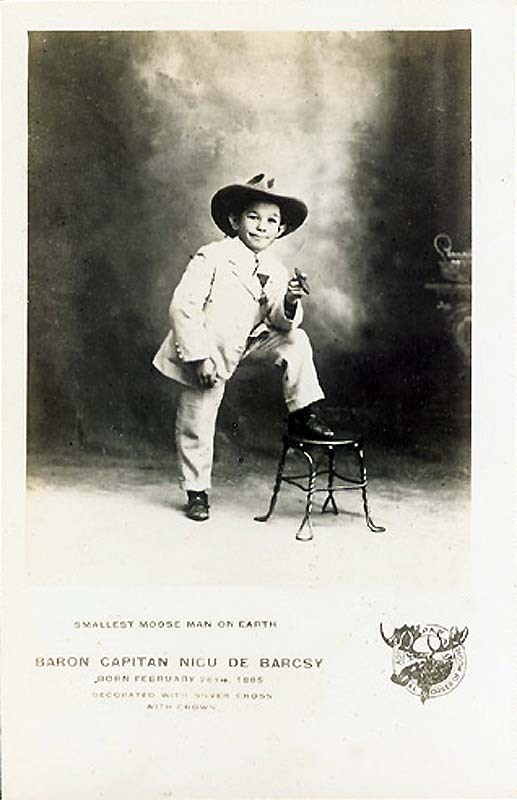 Trio seeking rewarding position — sophisticated bearded woman, of royal lineage; midget son, who does card tricks and performs on or with small animals; and wild Indian man, trick roper. Temporary financial embarrassment requires small advance. Serious only need apply. This ad was spotted by W. H. "Bill" Campbell, a nephew of the Campbell Brothers for whom the de Barcsy's had worked in happier times. Campbell met Sidonia's terms, and the three joined his wagon show, which wintered every year on farmland he owned outside of Drummond, Oklahoma. That first chilly Oklahoma winter was difficult as Madame de Barcsy was low on cash, and Buck and Nicu had no money of their own. An auto dealer who owned a boarding house took them in on credit, with assurances he would be repaid in full the following season. Madame de Barcsy was charmed by the small prairie town and gratified by the trust and help she received from its inhabitants. She announced she intended to return to Drummond to make it her permanent home. That spring, Sidonia, Nicu and Buck played a full season on Coney Island. They returned to Drummond with several thousand dollars, which Sidonia used to purchase a plot of land and build a brick home on Drummond's main street. She was well accepted by the citizens of Drummond, who were accustomed to see her around town wearing a hat covered with a large scarf which was knotted under her chin to hide her beard, so as not to cause too much of a sensation. Even in retirement Sidonia refused to get rid of her greying beard, telling people that "God sent this beard to me and I won't take it off." Sidonia, Nicu and Buck continued to play in large and small circuses for the next eight seasons. However, Sidonia had begun to develop diabetes, and as her health waned her appearances became less frequent. By 1923, Sidonia had largely retired. As she grew ever more ill and unable to bring in a paycheck, Buck abandoned Sidonia for the more lucrative and still working dwarf woman Dolletta Boykin, the recently widowed "Smallest Mother in the World". Sidonia heard that Buck and Dolletta wintered in Texas, but Sidonia never attempted to file for divorce (perhaps because there had never been a legal marriage between herself and Buck). Sidonia de Barcsy passed away in her 59th year on 19 October 1925, due to her diabetes and complications from a cold. A funeral was held for her in Drummond, and then little Nicu (now 40 years old) accompanied her body by train to Kansas City, Missouri — which was the nearest town with a crematorium. Sidonia's remains were sent to New York to lay in a crypt beside those of the baron. 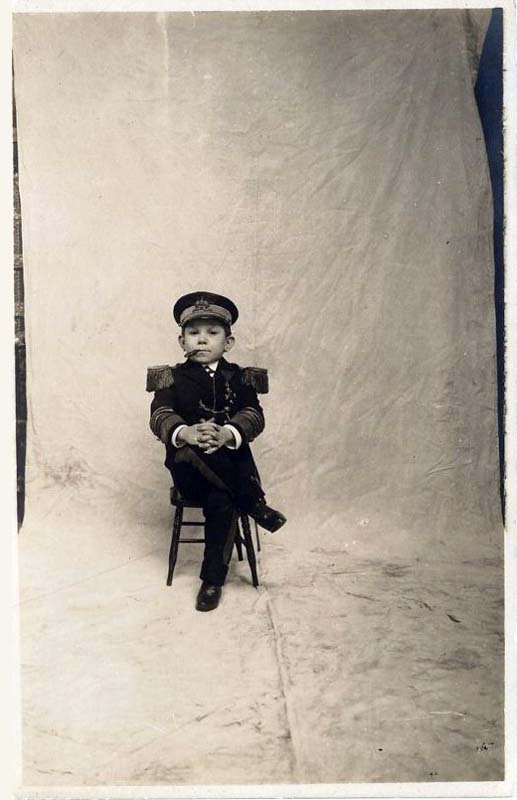 Little Nicu continued to exhibit himself for several years after Sidonia's death and Buck's departure, but he retired to the house in Drummond in 1937. Nicu claimed his reasons for retiring were fear of kidnappers, and his conviction that the dust of the road would kill him. Nicu gained a reputation as a local character who freeloaded meals from neighbors and demanded that gawking tourists pay him fifteen cents to watch his trained dog smoke a pipe. Eventually monetary problems overcame Nicu and he was forced to seek welfare assistance. This was especially ironic in light of statements Nicu's mother had confided to certain Drummond residents: that Nicu, himself now a baron, should rightly share in the sizeable estate of an uncle in Hungary, but important papers proving his birthright had been lost in a circus fire in Illinois. In his later years Nicu experienced ever increasing kidney problems, and after frequent hospitalizations his friends convinced him to enter a nursing home in Enid. His health worsened and he was confined to a wheelchair. The state demanded that Nicu's house – now long vacant and the frequent target of vandalism – be sold in order to defray Nicu's medical expenses. The house sold at auction for much less than Sidonia had originally paid for it half a century earlier. Nicu never fully understood what had become of his home, and often begged visitors to take him back there. Nicu never knew that Sidonia's house had been bulldozed. Nicu died in the Enid hospital on 31 July 1976, at the age of 91. 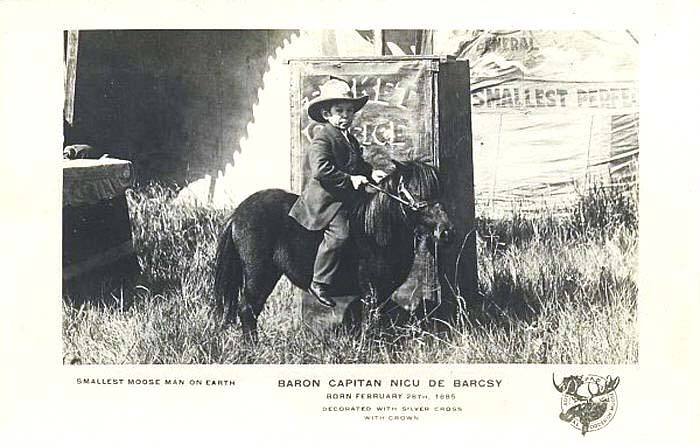 The patrons of a local bar he frequented took up a collection to pay his burial expenses, and he was interred in the Del Norte Cemetery, under a marble monument marked "Baron Capitain Nicu de Barcsy, The Smallest Perfect Man on Earth".